Automatically Wakes up, Measures Temperature and Stores Values in 122kB of Datalog Memory in 8- or 16-Bit Format. Digital Thermometer Measures Temperature with 8-Bit (0.5°C) or 11-Bit (0.0625°C) Resolution. Water resistant or waterproof if placed inside DS9107 iButton capsule. Sampling Rate from 5min up to 273hrs. Programmable Recording Start Delay After Elapsed Time or Upon a Temperature Alarm Trip Point. Programmable High and Low Trip Points for Temperature Alarms. Quick Access to Alarmed Devices Through 1-Wire Conditional Search Function. 512 Bytes of General-Purpose Memory. Two-Level Password Protection of All Memory and Configuration Registers. Communicates to Host with a Single Digital Signal at up to 15.4kbps at Standard Speed or up to 125kbps in Overdrive Mode Using 1-Wire Protocol. Operating Range: -40°C to +85°C. Digital Identification and Information by Momentary Contact. Unique, Factory-Lasered and Tested 64-Bit Registration Number (8-Bit Family Code + 48-Bit Serial Number + 8-Bit CRC Tester) - Assures Absolute Traceability Because no Two Parts are alike. Multidrop Controller for 1-Wire Net. Chip-Based Data Carrier Compactly Stores Information. Data Can be Accessed While Affixed to Object. Button Shape is Self-Aligning with Cup-Shaped Probes. Durable Stainless Steel Case Engraved with Registration Number Withstands Harsh Environments. Easily Affixed with Self-Stick Adhesive Backing, Latched by its Flange, or Locked with a Ring Pressed Onto its Rim. Presence Detector Acknowledges When Reader First Applies Voltage. Meets UL#913 (4th Edit.). Intrinsically Safe Apparatus: Approved Under Entity Concept for Use in Class I, Division 1, Group A, B, C and D Locations (application pending). The iButton® temperature logger (DS1925) is a rugged, self-sufficient system that measures temperature and records the result in a protected memory section. The recording is done at a user-defined rate. A total of 122K 8-bit readings or 61K 16-bit readings taken at equidistant intervals ranging from 5min to 273hrs can be stored. In addition, there are 512 bytes of nonvolatile memory for storing application-specific information. A mission to collect data can be programmed to begin immediately, after a user-defined delay, or after a temperature alarm. Access to the memory and control functions can be password protected. The DS1925 is configured and communicates with a host computing device through the serial 1-Wire® protocol, which requires only a single data lead and a ground return. Every DS1925 is factory-lasered with a guaranteed unique 64-bit registration number that allows for absolute traceability. The durable stainless-steel package is highly resistant to environmental hazards such as dirt, moisture, and shock. Accessories permit the DS1925 to be mounted on almost any object, including containers, pallets, and bags. Environmental and thermal management systems (HVAC). Human and animal temperature monitoring. Temperature-critical product shipping and storage, such as fresh produce, pharmaceuticals, and blood products. Q: Can this iButton be mounted on an object with the use of some type of epoxy or would that call for an insufficient reading? A: I'd suggest looking at the DS9096P+ for mounting the logger. I'd expect DS9096P+ to provide a bit more insulation from the object. * See Typical Product Lifetime graph for more details. What is the expected battery life of the Thermochrons? How often can the Thermochrons take readings? 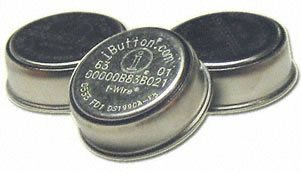 What temperature ranges can iButtons monitor? I just purchased a new 64 Bit Windows PC and the software CD I previously purchased does not include a 64 bit version? I just got the DS1922L, DS1922T, DS1922E or DS1923 and it will not work with my old software. What can I do? Can the Thermochrons be submerged in water? Can the DS1923 be buried to measure soil moisture? Can I use a DS9107 waterproof capsule with a Hygrochron DS1923? What do I need to use the Thermochrons? Logging rate faster logging rates consume more power. Logger type DS1921 models typically perform better from a battery life perspective. Temperature range of operation batteries perform best at room temperature moving to either extreme reduces performance. The biggest reduction being at the higher operating ranges. Selected resolution (DS1922 & DS1923 only) low resolution is more favorable to battery performance. The logging frequency supported by the Thermochrons varies by logger model. The DS1921 models can log temperature data every 1 to 255 minutes. The DS1922 & DS1923-F5# can record data every 1 sec to 273 hours. General purpose - These units cover a wide range of monitoring needs from freezers up temperature well above those observed in Death Valley. These are commonly used in cold chain applications and a host of bioscience studies. Specialized units - These units have a smaller temperature range but offer a better resolution than the DS1921G while at a similar price point. -5°C to 26°C DS1921Z ideal monitor temperature sensitive products in transit such as produce & medical drugs. 15°C to 46°C DS1921H ideal for monitor temperature within climate controlled buildings and body temperature. The Thermochrons steel enclosures are designed to withstand harsh environments, making these extremely reliable in a wide range of applications. While the Thermochons are considered to be ''water resistant'' due to their IP56 (Ingress Protection) rating, they cannot be classified as waterproof, and should not be submerged unless accompanied by a DS9107 waterproof capsule. An IP rating refers to the Ingress Protection on any piece of equipment against external objects such as; water, steam, liquid, dust, etc. The format for IP ratings shows (Ingress Protection) followed by two digits. The first digit indicates the protection against solids, and the second indicates the protection against liquids. See chart below for specifications on protection levels and limitations derived from IEC standard 60529. The DS1923 cannot be used to measure soil moisture. When a DS1923 is buried the %RH will read 100+%. Also, it would likely be damaged due to water ingress over time. The DS9107 waterproof capsule is designed as a protective enclosure that prevents the ingress of water and moisture. The DS1923 is a temperature and humidity logger, and while it can record temperature inside a DS9107 waterproof capsule, it cannot record accurate humidity readings for the ambient air (outside of the DS9107+). There are several software and hardware options for the missioning and downloading aspects of the Thermochrons. The most common solution is exhibited by the SK-IB-R iButton Connectivity Kit, which includes all the necessary components to connect the Thermochrons to your Windows computer via USB, mission the Thermochrons, and download the temperature and/or humidity data. To learn about all the missioning and downloading options, please look at the Starter Kits section of our website.